Unlike other investment books that dole out one brand of advice toa potentially diverse readership, this unique book guides you toyour own best personal strategy by showing you what types of stocksfit your individual style. 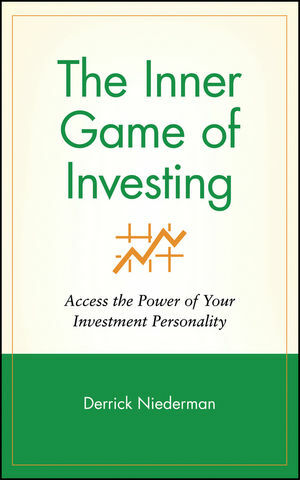 Written in a witty and engaging style bysecurities analyst and long-time financial columnist DerrickNiederman, The Inner Game of Investing reveals the Seven StockMarket Personalities: The Bargain Hunter, The Visionary, TheContrarian, The Sentimentalist, The Skeptic, The Trader, and TheAdventurist. You will be amazed to see how your own psychologicalattributes and predispositions interact with the market and howthey may be blinding you to both habitual mistakes and goldenopportunities. Niederman's invaluable insights extend into other aspects ofinvesting, including widely held, but often misguided beliefs aboutthe irrationality and efficiency of the market, the psychologicalnuances of dealing with market professionals, and the generalpsychology of analyzing stocks. The Inner Game of Investing shines a light into areas of yourpersonal investment process. This is one book that could change theway you invest and raise your stock market skills to a level younever thought possible. DERRICK NIEDERMAN is a mathematician turned securities analyst and financial writer. His credits include a PhD in mathematics from MIT and articles in a wide variety of financial publications, most recently as a contributing editor at Worth magazine. He is the author of This Is Not Your Father s Stockpicking Book: Profiting from the Hidden Investment Clues Found in Everyday Life. As a gamesman, Niederman is a former national squash champion and a life master in duplicate bridge. The Psychology of Analyzing Stocks.